FREE MICHIGAN: It’s a Beautiful Day in the Neighborhood; Blog Focuses on U.S. Rep. Rogers. It’s a Beautiful Day in the Neighborhood; Blog Focuses on U.S. Rep. Rogers. Now this is a good watchdog site, albeit a bit limited in focus. 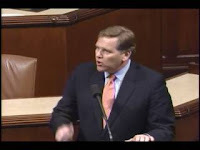 Rep. Mike Rogers, who represents parts of mid-Michigan, is a polished politician who delivers a pretty standard moderate Beltway rap – the feds spend too much (now that the president is a Democrat), we need a strong defense, the auto industry is in trouble, blah blah. Nothing truly courageous. To one end, he recently introduced his own site in the name of government accountability. Notice the links go to mostly government-administered Web sites. Talk about the wolves watching the hen house. It's a true bureaucratic answer to transparency. "Let us do it." But Mr. Rogers Neighborhood rightly focuses on the hypocrisy that comes from our elected representatives, and with some good humor.